The Rag Market is nearly here! Yes, it’s that time again! We’re doing some frantic last minute baking, sorting through our bookshelves and getting ready for a busy day tomorrow. 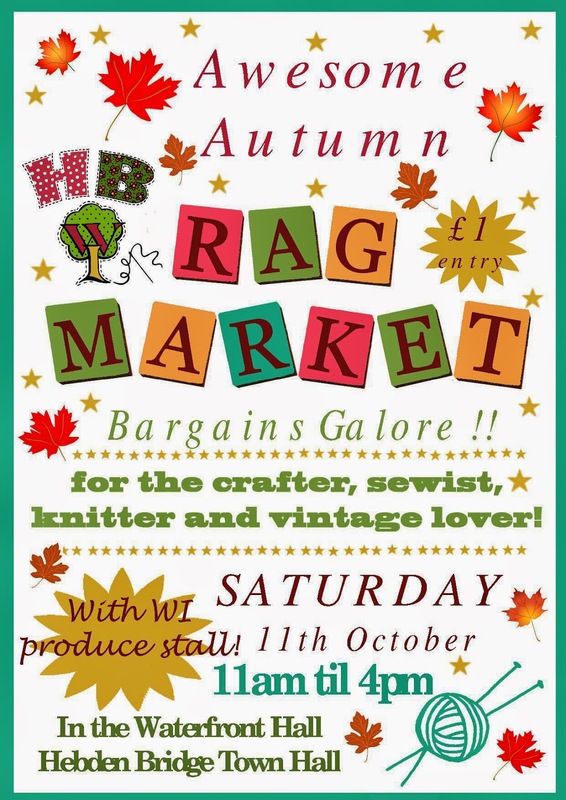 On Saturday 11th October, Hebden Bridge Town Hall will be filled with an amazing selection of textiles, haberdashery, and other crafting materials when the ever-popular WI Rag Market makes a welcome return. What’s a Rag Market we hear you cry? Well, it’s not a place to sell old rags; it’s a traditional term for a textile market. With the continuing trend for ‘make do and mend’ and the rise in the popularity of homemade furnishings and clothing thanks to programmes like The Great British Sewing Bee and Kirstie’s Homemade Home, the bi-annual Hebden Bridge Rag Market is becoming well known amongst textile fans and crafters in Calderdale and beyond. Many of the fabrics on sale are vintage, one-offs or from private collections, so you can pick up unusual items that are not available in the shops. There are also books, buttons, stamping equipment, decorative paper, ribbon and lace, old patterns, needles and tools and a myriad of other delights to rummage through. It’s a real treasure hunt and you never know what you might find. In addition to a hall full of wonderful textile bargains, we’re adding a second-hand bookstall to our usual WI produce stall. So come along, grab a bargain and get started on that Christmas crafting! Oh, and if you’re on Facebook, why not follow our Hebden Bridge WI Rag Market page to keep up to date with all the rag market news. Or you can follow the Rag Market Twitter.